Chthamalus/Balanus percent cover in barnacle plots at Point Bonita was relatively high when Long-Term Monitoring surveys were initiated in 2006 then underwent a large dip to a level (46% cover) in 2007 which has subsequently remained at about the same through 2010. Rock usually accounted for cover when barnacles were not present indicating that the barnacle decline was not caused by displacement brought about by invasion of another species. The diversity of invertebrate taxa was low in barnacle plots as was observed at other barnacle plots in Marin County. Only limpets and Littorina spp. were found to occur in appreciable numbers. Littorina abundance increased more than sixfold from 525 in 2006 to 3425 in 2010 exhibiting a pattern of abundance over the years which was similar to the pattern observed for Littorina in Endocladia plots at Slide Ranch. Point Bonita is only 4.7 nautical miles downcoast from Slide Ranch and it is possible that the Littorina at the two locations are responding to the same environmental factors. Limpet abundance fluctuated somewhat during the survey period with an overall increase from 2006 (121 limpets per plot) to 2010 (223 limpets per plot). Mytilus californianus cover in mussel plots was relatively steady during the five years in which the site was surveyed. The initial cover in 2006 was 80% with the cover for the last year surveyed (2010) being 86%. This pattern of continuously high mussel cover is similar to that observed at Santa Maria Creek, Bolinas Point and Slide Ranch which are nearby Long-Term Monitoring sites also located in the Gulf of the Farallones. This stretch of coastline is afforded some protection from strong winter northwest swells by the Point Reyes Peninsula and Point Bonita itself as the intertidal plots are tucked behind the point. This protection may account for the lasting integrity of the mussel beds at Point Bonita. The numerically dominant motile Invertebrates observed in mussel plots were limpets, Littorina spp., Nucella spp. and Tegula funebralis. Littorina abundance fluctuated considerably with the highest observed abundance (896 per plot) occurring in 2009 one year before the lowest abundance (145) in 2010. Intermediate values were observed during the other years in which surveys were conducted. 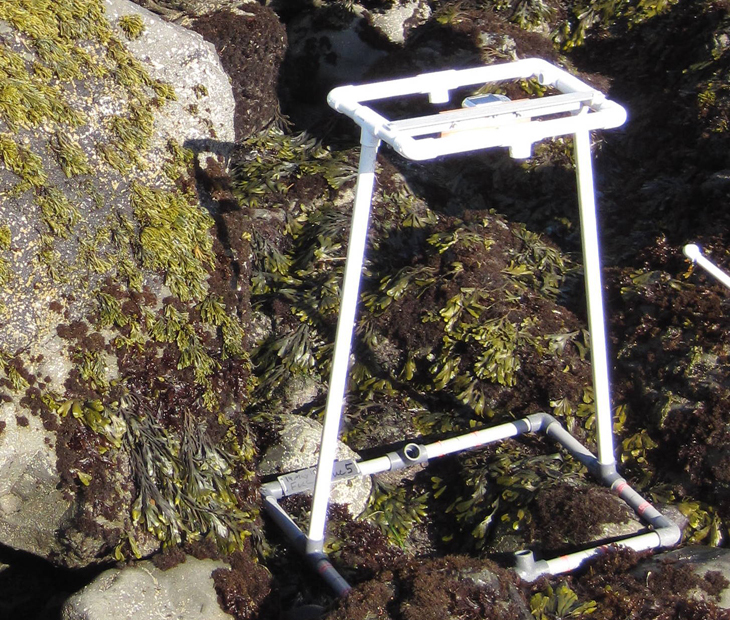 Limpet abundance was very steady (216 to 276 per plot) during the entire study period. Nucella spp. abundance was higher in mussel plots at Point Bonita than any other MARINe plots surveyed in Marin County. Abundance was steady (between 14 and 29 per plot) between 2006 and 2010 with the exception of 2008 where less than two individuals were observed per plot. Endocladia cover in Endocladia plots at Point Bonita declined from 71% in 2006 to 52% in 2010. The largest drop occurred between 2007 (70% cover) and 2008 (46% cover) with subsequent cover remaining constant (52%). Mastocarpus cover was highly variable reaching a peak of 43% in 2008 and then sharply declining to 10% by 2010. Space not occupied by Endocladia or Mastocarpus was primarily bare rock. The numerically dominant motile Invertebrates observed in Endocladiaplots were limpets, Littorina spp. and Nucella spp. Littorina was present at the same order of magnitude as Littorina enumerated in mussel plots but had much lower abundance than barnacle plots at Point Bonita. Littorina counts dropped sharply between 2007 (595 per plot) and 2008 (97 per plot) then sharply rebounded to 527 per plot in 2010. Limpets had the same pattern as Littorina with similar abundance at the beginning and end of the survey period and a precipitous drop in 2008. 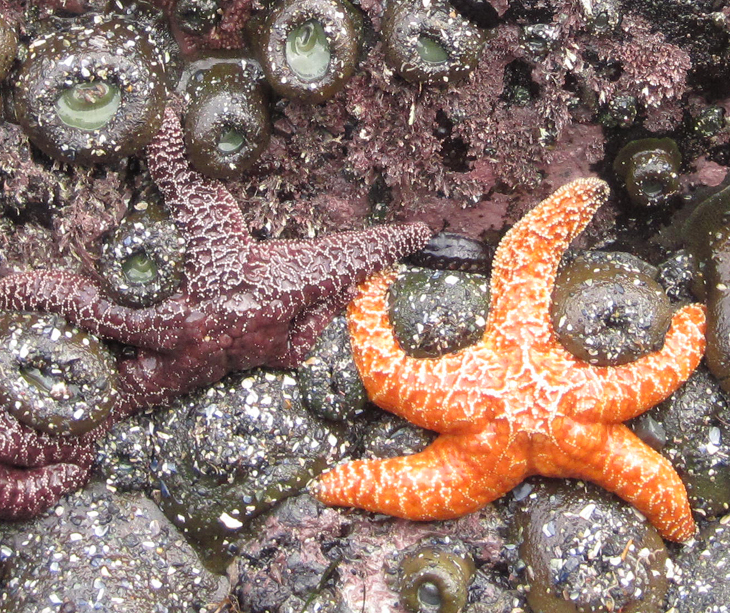 The low counts of limpets and Littorina in 2008 may reflect environmental conditions during that year.There was also significant seastar recruitment at Point Bonita in 2008 (see below). Pisaster (Ochre Star) numbers fluctuated twofold over the course of the time series. The highest counts were tallied in 2008 when a high proportion of the individuals observed were small suggesting that the high numbers were the result of a recruitment event. 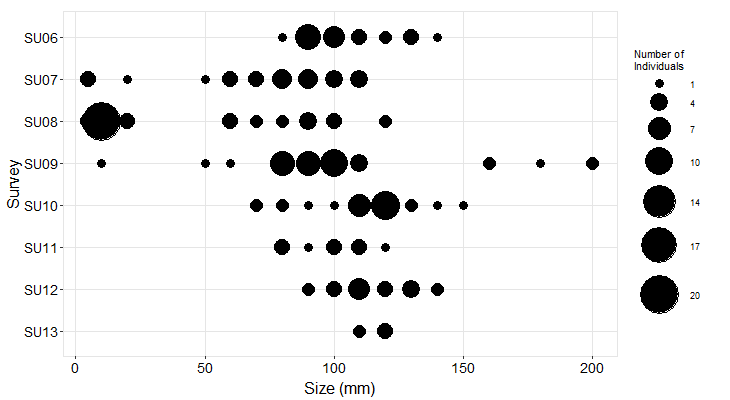 Small individuals (< 50mm) were much less common in other years. The bat star Patiria miniata was also consistently observed in rather low numbers at Point Bonita. Patiria is uncommon in Long-Term Monitoring surveys because its preferred habitat is typically low intertidal / subtidal.